While watching the anime, I found myself feeling sad… while watching the live action movie, I found myself crying throughout the film. I’ve really wanted to watch this movie for quite some time but I couldn’t find the English subbed for it, and so eventually watched it on crunchyroll instead. I enjoyed it and it was faithful to the original which I liked, except the ending was better, hehe. I thought it was funny how characters like Junko had a scene that last about half a minute, teehee. No Sachikos though. I liked the choice they made in terms of which characters appeared and which parts were left out. Yuna Ito playing as Reira was funny.. I’m glad they decided to add the “Stella” part in the movie but it would have been cuter if she did that pose! I don’t think this series is for everyone though, and it wouldn’t make much sense (and may even appear boring) if you haven’t seen the first movie. I also enjoyed watching “Ready-Steady-Nana” and “The Other Side of NANA2” (the Making) afterwards which was heaps good watch =) I would have preferred all the original cast from the first movie but I guess Yui Ichikawa taking over Hachi’s role wasn’t too bad. I just finished the final episode of NANA “season 1” (episode 47) and I would have to agree with Somps.. it was quite disappointing and didn’t have any sense of closure. hahah..I’m kinda annoyed with the loose ends..after watching that many episodes, what happened that I didn’t know was going to happen? XD Like Inuyasha, the manga is still ongoing (beyond anime)… though I don’t think I’ll read it. With some luck, season 2 of the animation might be made. Never know. Pick up the pace Jen, pick up! how much of a fan..? I can’t get NANA out of my head now. I knew it was a bit of a dangerous move to watch an anime series in the middle of Uni year, especially one as good as this. Last night I watched another 10 episodes, which meant I watched 20 episodes in two days o_o Today I was forcing myself to work on my Winter Gen Ed assignments, but in the back of my head NANA would be there. In fact, even as I type this I’m trying hard not to watch any until I’ve done a decent amount of work. To backup my statement further… I had a dream I was hanging out with Nana- she was SO COOL.. lol… this isn’t..good. From previous experience, my mind works like this: If it’s good and I have to keep watching it, then watch it all as quickly as possible so you can get over it sooner! That doesn’t sound very nice though, to kinda “get over it” but I need to look at the big picture and see what’s really most important. I remember the old days people would say I’m an “anime freak”, but really..I’m not. I’m NOTHING compared to those crazy otaku such as M12 who has probably watched 100x more series than I have. I occasionally watch anime, buy manga, collect some figurines but that’s about it. I don’t watch series just to say “look how many anime titles I know/seen!” I’m pretty specific and picky on titles and won’t see series just because everyone is watching it, like Naruto or Bleach. Death Note is a different story though, I know it’s going to be good based on Jen’s Trusted Sources. It is likely that’s the next series I’ll watch after Nana, which will probably happen at the end of this year- when Uni’s over. For the meantime.. I just wanna say I love NANA. I wish it didn’t occupy my head in such a time, but I’m glad I’m enjoying it as much as I am. Staying at home not knowing what to do with myself, I ended up watching the first (EDIT:)10 episodes of NANA the anime. Sleeping didn’t seem to help fight the virus, but I wasn’t well enough to actually do anything. I have to get better by tomorrow no matter what! Missing out 2/5 days of my winter course is a complete no-no, and I have tutoring in the arvo..
Anyways, I’ve uploaded OLIVIA’s- “a little pain“, the end themesong for NANA who I believe is the character for Reira. It’s a nice song, and the series is quite touching. In comparing with the movie so far, all of Hachi’s back story was cut out, but Nana’s history with Ren was all kept. Comments Off on 07.07.07 Happy NANA DAY!!! Have I ever mentioned how I love this song? I saw the MV of it a while back but I finally found the mp3 of it! Go go download ^^ She has a lovely voice! Yes, I’m anticipating NANA2. I want to watch NANA2..can’t wait!! I just saw the trailer for it… so good X3 I wish Hachi didn’t change actress though. I miss Nana.. even though I’ve watched it 3 times before. I was thinking of getting the manga, but it’s very looong.. Sometimes I surprise myself..I woke up at 1pm today o.o Thats my..record…lol..
I’ve actually been wanting to watch some anime series this break, I’ve been downloading them for a while, but never got the chance to watch it, or when I do have time- I’m not in the mood for anime. 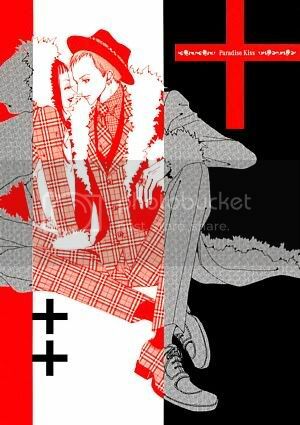 Today I finished off Paradise Kiss, and it reminded me of Nana, it has a similiar style~ but hey, it was written by the same person, so obviously it would. There was something about this series that got me hooked, the illustrations are a little strange but interesting (main thing that disturbed me was their large lips) but I got disappointed at the ending. The characters pretty much dispersed, everyone moved on in their seperate lives. I was a little confused at the ending, but it seems the main couple didn’t end up together, I think that’s what really annoyed me. Their relationship was similiar to Yuki and Shuichi from Gravitation (except this couple is not homosexual) but they ended up together and I liked that…here, they just seperated v.v it is somewhat depressing. This series feels a little unusual, but was attractive at the same time- don’t know how to describe. I’m currently downloading Nana the anime, as well as Return of Condor Heros 06 featuring Liu Yi Fei, but I think I’ll watch them when they’re all out, I don’t particularly like to have to wait for each episode to come out. On another note, the TVBJ series I’ve been following every weeknight- Au Revoir ShangHai is ending this Friday, how exciting. This series turned out way better than expected… well, I didn’t expect anything from this- so that made it better! haha.